They don't call it the Flagship for nothing - Jeremy has put more time into the refinement of this deck than nearly any other board offered by Jones and it shows. 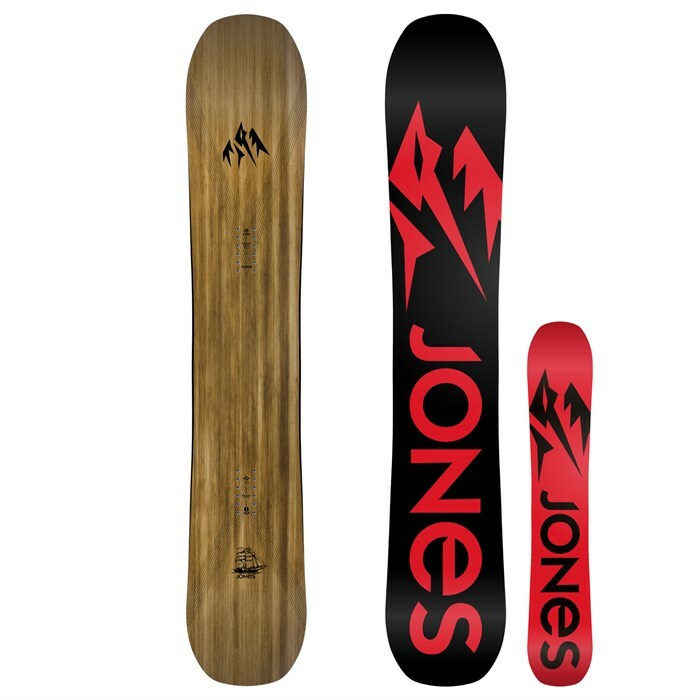 For this season, the Jones Flagship Snowboard is back with a re-worked Power Core that is more responsive than ever and works with the signature Spoon 3.0 shaping at the tip and tail for boating through pow, slaying the steep, ninjaing the trees and laying arcs with confidence. Basalt stringers combine with flax and triax glass for the refined power and pop the Jones Flagship Snowboard is known for. Spoon 3.0  Freeride focused 3D-base contours featuring an even balance of spoon bevel in the nose and spoon bevel in the tail. Spoon bevel starts at the rocker point. Re-Profiled Power Core  More torsional stiffness between the feet. Power V Basalt Stringers  Natural Pre-Cured Basalt stringers transfer power from under your feet to the tips of the board to help eliminate nose and tail chatter. Flax  A durable, sustainable and high performance dampening fiber. Triax Fiberglass  Multi-axis, stitched fiberglass laminate that offers a precise and responsive ride in any ­terrain or snow conditions. Sintered 9900 Base  Sintered Ultra High Molecular Weight polyethylene with carbon additives. Flip Flop Base  By flip flopping the base graphic colors, P-Tex waste is drastically reduced by increasing the material yield. All-Mountain All-mountain snowboards are designed for exploring the whole mountain. They are your go-to for a snowboard that will do anything. They feel at home on groomers, powder, park runs and almost anything in between. The vast majority of snowboarders choose all-mountain boards for their great versatility. If you’re just getting started or unsure of exactly what you need, an all-mountain snowboard is a great choice. Freeride Freeride snowboards are designed for the rider that spends most of the day off groomed runs and in backcountry terrain. They typically have a stiffer flex and are ridden in longer sizes than freestyle snowboards. Freeride snowboards often feature a directional shape that is designed to perform optimally in one direction. Powder Powder snowboards love powder. Often associated with freeride snowboards, powder boards sometimes feature a wider nose and a tapered narrower tail. The binding inserts, which determine the rider's stance, are often set back on a powder snowboard to help the rider float the tip of the board through the deep stuff. Powder snowboards sometimes also feature rocker, a design element where the tip (and tail) rise starts farther back on the board, which also helps the rider maintain tip float through the pow.